BRYAN GALLAGHER PHOTO Shelter Island School senior running the first leg of the championship distance medley relay team during the New York State Winter Track Championships Saturday at the Ocean Breeze Athletic Complex in Staten Island. On Saturday, March 3, Joshua Green made history. PETER BOODY PHOTO | Doug Matz at his home on Tarkettle Road. 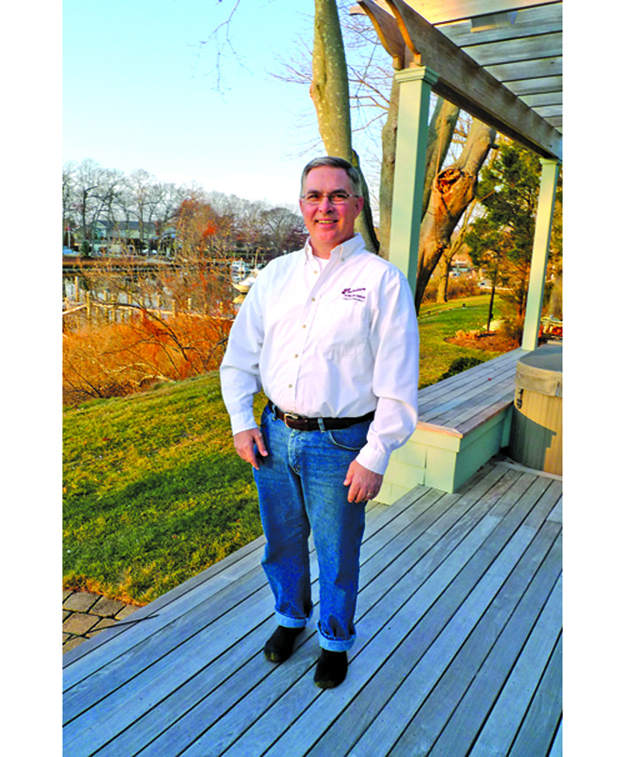 As the owner of Flanders Heating & Air Conditioning, Islander Doug Matz can’t help but dive into his work, heading every day to his office in Flanders and job sites across the East End. It used to be that flying, or making offshore fishing expeditions on his 30-foot boat, hunting giant tuna or going after cod off Gloucester, were the only ways he could keep himself away from the job. Then 9/11 happened. He lost one of his best friends from his hometown of Hampton Bays, a man who worked for Cantor Fitzgerald in the twin towers. “That changes your thoughts,” explained the Shelter Island EMS board member and chairman of the town’s Zoning Board of Appeals. After some deep thinking, he married the young woman from Gloucester he’d been dating; bought his own business after working for the company that had acquired his grandfather’s and father’s heating firm in 1998; and eventually bought a big, silver converted-bus camper that can be seen in the summer months on its own parking ramp outside his high-gabled house on Tarkettle Road. “The big reason the camper exists,” he said last week, “is to do things with the kids,” his two step-sons, Clarkson University freshman Wyatt Brigham and Shelter Island High School senior Carter Brigham. There’s also 19-month-old Michael Joseph Matz. After 9/11, he also sold his airplane, a Cessna Skylane that had made it easy to get to his future wife Melanie and his fishing boat when it was up in Gloucester. But with his own business, he wasn’t flying enough to keep sharp. For years now, whenever the boys have free time, Melanie and Doug are off and running in the camper, making weekend trips to New England and Canada in the spring and fall and longer trips during vacations and every summer to Florida and the West Coast with Yellowstone, Salt Lake City and the Grand Canyon in between. “It’s a great chance to be together as a family and for the kids to visit so many different places. And with a 19-month-old, we’ll have the chance to do it all over again,” he said. Doug Matz was born in 1963, grew up with two sisters and graduated from Hampton Bays High School in 1981. He went on to study mechanical engineering at SUNY Farmingdale to prepare for a career with the family business, Matz Heating and Air Conditioning. His grandfather had worked in Astoria, Queens for a surgical instrument company before finding a job at Brookhaven National Lab and moving his family east to Hampton Bays. He started the family company in 1948 after building up a side business making sheet metal products and installing heating ductwork for local plumbers. He never considered doing anything else but his father allowed him to make that choice, he said. “He never had that option. He was forced,” Doug said of his father, who was happy to sell the business in 1998 and now lives with Doug’s mother in northern New Hampshire. Doug’s two sisters both live in the Hampton Bays area. Doug was made district manager for the large firm that bought the Matz company (and other firms around the country) and had a combined revenue of more than $1 billion. “I was traveling all over,” from New Hampshire to Virginia, with frequent trips to headquarters in Dallas. “It was a college education going from a company with 40 employees to having multiple locations and dealing with much larger issues,” he said. A good friend, Charlie Wyatt — a partner at Otis Ford in Quogue, from which Doug had bought a lot of company vehicles — has a place on Tarkettle Road. “So I’d come over here and stay in the harbor and borrow his car and drive around the Island,” Doug said. That cottage was located about where the living room is now in the Matzes’ high-gabled, shingled home, which they built after heading off to St. Lucia and getting married without telling anyone. It was a second marriage for both. During construction, the town issued a stop-work order requiring an application to the ZBA. He’d had experience as a businessman dealing with the ZBA in Southampton Town. Community concerns and neighborhood impacts far into the future must be considered, too, he said. The experience inspired him to seek a ZBA seat. Instead the Town Board appointed him to the Licensing Review Board, which had to handle some difficult cases during his time. When another opening came up on the ZBA, he applied again and was appointed. That was about five years ago. The Town Board tapped him to be its chairman in 2011. Flanders Heating & Air Conditioning has 38 employees and a management team that allows Doug to head off on those camper trips. But when he’s here, he works. Will any of the boys want that for themselves? With one of them not yet two years old, retirement could be far down the road for the current boss.